The Great Dividing Range is the dominant landform feature in the North East region. Dry ‘rain shadow’ valleys contrast with adjacent mountains that are characterised by montane forests and, at higher elevations, sub-alpine woodlands and alpine herbfields (C of A and Victorian RFA Steering Committee, 1998). The northern section of the Upper Murray Basin is composed of a series of mature valleys with broad alluvial flats as well as raised terraces and fans. Also here are the Koetung uplands, a dissected plateau of rises and low hills, one of three distinctively raised areas in the North East. Meanwhile, parts of the far north of the Basin consist of broad alluvial plains. In the centre of the Ovens Basin, wide valleys have developed along the King and Ovens Rivers. Northward lie riverine floodplains that surround Lake Mulwala. 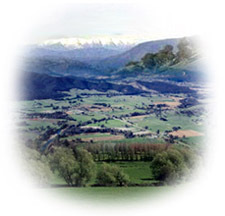 The Kiewa River’s headwaters are on the mildly dissected plateau of the Bogong High Plains in the south of the Basin. The east and west branches flow almost parallel down steep gorge-like valleys. To the south of these lie narrow floodplains downstream of Mt Beauty. There is a small plateau at the top of Mt Bogong at 1986 m while the Kiewa River is bordered by rolling foothills with alluvial flats rising to steep slopes. The Stanley Plateau and Mount Big Ben lie to the west. Commonwealth of Australia (C of A) and Victorian RFA Steering Committee, (1998). North East Victoria: Comprehensive Regional Assessment, Commonwealth of Australia, Canberra. Department of Water Resources, (1989). A Water Resource Handbook, Melbourne. Australia.